Diamonds can occur in nearly any color, though yellow and brown are by far the most common. "Black" diamonds are not truly black, but rather contain numerous dark inclusions that give the gems their dark appearance. Colored diamonds contain impurities or structural defects that cause the coloration, while pure or nearly pure diamonds are transparent and colorless. Most diamond impurities replace a carbon atom in the crystal lattice, known as a carbon flaw. The most common impurity, nitrogen, causes a slight to intense yellow coloration depending upon the type and concentration of nitrogen present. The Gemological Institute of America (GIA) classifies low saturation yellow and brown diamonds as diamonds in the normal color range, and applies a grading scale from 'D' (colorless) to 'Z' (light yellow). Diamond, meaning the unconquerable in Greek, has fascinated people for centuries. The atomic structure renders the property of hardness of this most brilliant of all the perishable substances known to man. Diamonds come in different colors including pink, white, champagne, pink champagne, yellow, blue and green. The pink diamond is by far the most rare and valuable diamond and surpasses the beauty of the white diamond. The Argyle mine accounts for 95 percent of total production. However, less than one tenth of one percent of all diamonds is classified as pink. The pink diamonds from Argyle come in varying shades from delicate pastel rose to raspberry and full-blooded purple red. This distinguishes them from the diamonds found in India, Brazil and Africa that are lighter. 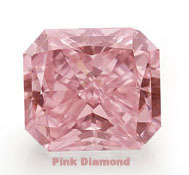 The price of the Argyle pink diamond depends on the intensity of the colour. The white diamonds, as distinct from the pink ones, are produced all over the world and are available in different shapes and sizes. The white diamonds from the Argyle mine are of higher quality. The white diamond displays flashes of pink, when seen from the top. These are more expensive and their depth and strength determine their price. Another type is the Champagne diamond. They come in colors ranging from light straw to rich cognac. Normally, the intensity of color is given more importance in the valuation of the colored ones. Pink champagne diamonds are more expensive than the champagne diamonds. The yellow diamonds range from light yellow to a rich canary colour, while the blue diamonds, range from sky-blue to a steely, metallic shade. The green diamond, in which the penetration of the colour is not very deep, is removed while fashioning of the stone.